CHICHESTER, UK (CelebrityAccess) — Pink Floyd drummer Nick Mason had an expensive weekend after he crashed one of the classic cars from his collection during a racetrack demonstration. 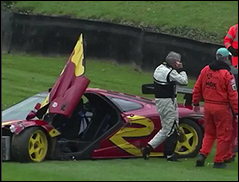 According to the Daily Mail, Mason was driving a McLaren F1 GTR in a practice lap at Goodwood Circuit in England when he lost control of the street-legal race car and crashed it into a safety barrier. The rubber-wrapped tire barrier then bounced the car back into the track with extensive front end damage. Fortunately, the 76-year-old Mason was uninjured in the relatively low-speed collision. The car is extremely rare, with some assessments of its value topping 15 million. Only 28 chassis for the 28 F1 GTR were built, and only 9 built in 1996.